1/4 cup cold water, ice cold, 3/4 cup ice cubes, 2/3 cup peeled cucumber, seedless, 2/3 cup honeydew melon, Zest of half an orange, 1/8 cup fresh mint, 3 scoops Naturade Total Soy Vanilla Flavored Meal Replacement Mix. 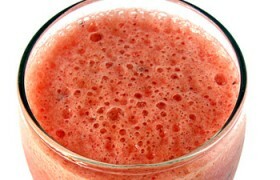 In blender or smoothie maker, combine water, ice cubes, cucumber, melon, orange zest, and mint and blend. Halfway through blending mix in two scoops of vanilla flavored Shake Mix. Process until very smooth. Garnish serving glass with additional orange zest curls, orange slices, cucumber slices or honeydew slices. Enjoy!